Our school district is examined each year by the Auditor of State, and this year's audit report has just been released. As shown on the "Schedule of Findings" section of the report, the State Auditor's Office found no problems, and our District was once again declared to be a "low risk auditee." I'm not sure what exactly that means in the context of a public entity, but when a business is audited, a declaration like this means that the auditors feel no need to look in every nook and cranny every year, and that they will generally gauge the accuracy of the financial reports, and the effectiveness of management and accounting controls, by looking in detail at only the accounts through which large amounts of money pass, plus a few others chosen at random. There was a comment in the Management Letter recommending that the School Board put in place a policy "requiring the approval of the Treasurer and the Board of Education prior to the establishment of any outside checking accounts in the District's name or for District sponsored activities. The policy should include oversight procedures to be performed by the Treasurer’s Office of Board of Education to ensure all District employees responsible for handling cash collections are adhering to the policy." This will require some thought. If you look at the Monthly Treasurer's Reports, you'll notice that many pages are taken up by the "Financial Report by Fund/SCC" section. 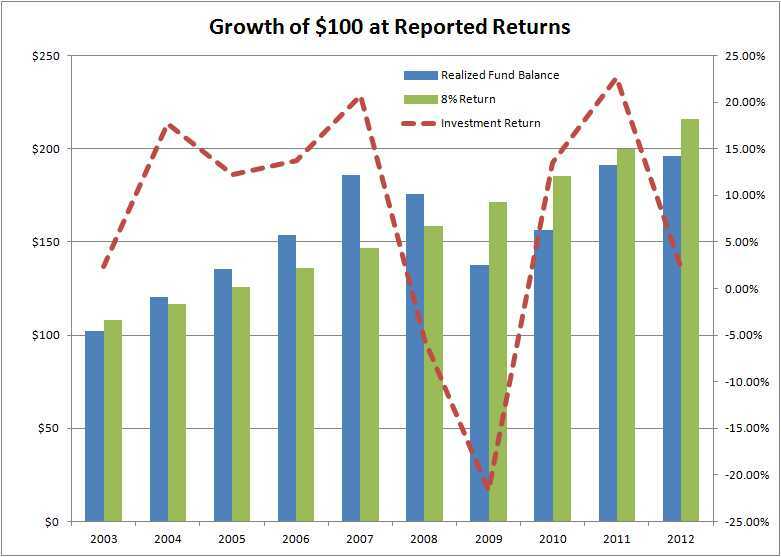 This lists the 300+ fund accounts managed by the Treasurer's Office. Some of these are the big primary funds through which most of our funding and spending flows, such as the General Fund. It also includes scores of little funds, like one set up for the Bradley German Club, which has a balance of $25.67. These are the 'official' funds, meaning the money is deposited into the bank by the Treasurer's office, and disbursements from these funds are made according to standard procedures, via official checks. But there are other occasions when fairly significant amounts of money are collected on behalf of a school activity, held in the hands of an individual - maybe a school employee, maybe a community member - and disbursed without controls, often in cash. This might be a school-sponsored club running a car wash to raise money for uniforms, selling trinkets to help fund a trip, and other similar situations. The School Board's Policy Review Committee will take the Auditor of State's recommendation, consult with folks such as the policy experts at the Ohio School Boards Association, and report back to the School Board. The audit reports for prior years can be found via the website of the Auditor of State. Just go to this search page, enter "Hilliard City Schools" and select "Franklin County." The supplemental materials are available here. Item F4 approves an increase in the hourly rate for substitute bus drivers (from $14.25/hr to $16.25 $15.75/hr)*, substitute bus aides, and substitute mechanics. We've been having a hard time filling absences in these roles because the neighboring districts are paying more than our current rate, and those qualified to serve as subs are filling those spots first, often leaving us without enough subs. This pay rate change will bring us back into range and, if I remember the numbers correctly, will cost an extra $100,000 $50,000 per year, but I'm double checking that(confirmed by the Treasurer). There will be no second Board meeting in December. The next meeting will be the annual organization meeting, which will most likely be held on January 14, 2013 at 6:30pm (this is an agenda item for Monday's meeting). The organizational meeting is when the School Board's officers for the year are elected, committee appointments are made, and various annual resolutions are voted on. Normally, the organizational meeting is followed at 7pm by a regular Board meeting. However, this schedule will not be official until after voted on Monday. 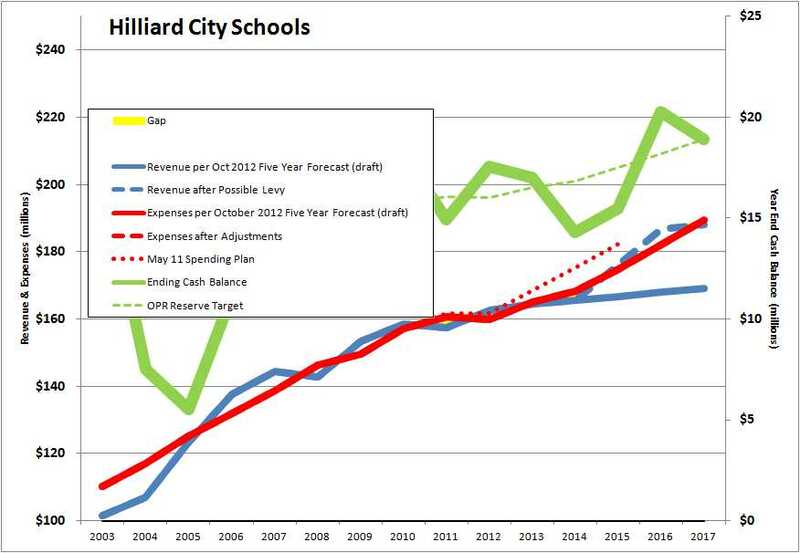 When an Operating Levy for the Hilliard City Schools is passed by the voters of the School District, one would expect that the revenue generated would indeed be used to operate the schools. But Ohio law provides for a mechanism called "Tax Increment Financing" (or TIF) which allows a municipality to redirect some of that school revenue stream to redevelopment projects that are the responsibility of the municipality. In other words, the City of Hilliard can - and does - grab some of the money that would otherwise go to Hilliard City Schools, and uses it to build roads, sewers, sidewalks, etc. As long as it limits its grab to no more than 75% of the additional revenue stream created by the redevelopment of a piece of property, a City doesn't even have to seek the permission of the School District, and the City of Hilliard doesn't. TIFs aren't always a bad thing. Every dollar of property tax paid by a commercial entity in our community is a dollar of property tax that doesn't have to be paid by homeowners. The School District has shown that it is willing to work with a City to grant TIFs to commercial entities, knowing that this is part of what is necessary to recruit businesses to come to our community, as we are competing with several other municipalities in the region for the same companies. It's better to grant a TIF and get x% of something than to lose the opportunity, and get 100% of nothing. Residential development is another matter. When a new residence is built, we get some additional property tax revenue, but we also, on average, get 0.8 more kids enrolled in our school district. It takes a home valued at about a half-million dollars to generate enough school property tax revenue to underwrite the cost of that 0.8 kids. Not too many new homes fall into that category. If the only new development in our school district is residential properties, then those of us already living here end up subsidizing the cost to educate the kids that arrive with those new homes. A new development of 500 homes valued at $250,000 will create the need for 1 mill of new property taxes on all of us to fund the difference. The best way to mitigate that is to encourage new commercial development. Why? Because we get new property tax revenue, but no new kids to educate. There have been times when the City of Hilliard and Hilliard City Schools have worked together to bring new commercial development into the City. By the way, the City of Hilliard does NOT own the Hilliard City Schools. These are two separate governmental entities, each with its own body of elected officials: the Mayor and City Council for the City, and the Board of Education (School Board) for the school district. Two good examples of a City and School District working together are the TIFs for BMW Financial and Boeringer Ingelheim Roxanne Labs. In the case of BMW Financial, a 100% TIF was granted by the City of Hilliard, with the support of the School District (ie 100% of the property tax revenue was redirected to the City for infrastructure improvements), but an arrangement was made so that the School District receives payments from BMW that are equivalent to we would have received had there been no TIF. For Boeringer Ingelheim, which is in the City of Columbus, the request was for a TIF on a major expansion to their already-substantial operation, which would in turn allow BI to compete within their firm for new business. Without this, BI might have moved some of its current operations out of the community. In time, the TIF will expire and the school district will receive its full share of the tax revenue. The thing that doesn't make sense is for a city to use a TIF to facilitate residential development. After all, applying a TIF to a residential development means the school district will get more kids to educate, but not much incremental revenue for doing so. Meanwhile, the city and the developer get to avoid the cost of building infrastructure with their funds. The Hilliard Mayor and some City Council members make the argument that apartments are 'commercial' rather than 'residential,' and therefore it is consistent with our shared interest in fostering commercial development to grant a TIF to an apartment complex. But in these economic times, more families are choosing to live in nice apartments in good school districts, rather than buying a house. They are unsure about their income, and concerned that property values might not hold up, especially if the school district runs into fiscal problems. The typical school property tax revenue for an apartment is about $1,000/yr. This means that for an apartment complex to be self-funding from a school perspective, there can be no more than one school-age kid for every 90 units. I haven't seen confirmed statistics yet, but I believe the new Hilliard Grand apartment complex (on Wilcox Rd near Hayden Run) has substantially more kids than that. The same is likely true for the Hilliard Summit apartments at the corner of Roberts Rd and Alton-Darby Rd. The City of Hilliard did grant a TIF for that apartment complex, and used the money to help fund the new intersection and connector. The Hilliard City Council will soon be deciding whether to grant a TIF to the new development being proposed for the site around the Starliner Diner. Part of this development will be retail space on the first floor, including a relocated Starliner Diner, but the rest will be 183 apartments or so. The design includes a realignment of Luxaire and Franklin Streets so as to create a new shortcut between Cemetery and Main Sts (bypassing the roundabouts!). Typically, the City demands that the developer pay for infrastructure upgrades, such as water/sewer lines, sidewalks, and street improvements. With a TIF like the one proposed, the developer still pays to for all this infrastructure work, but instead of eating that cost, the developer gets reimbursed by having what should have been taxes paid to the schools and the township (for fire/safety services) directed back to the developer, who may no longer own the property by the time the tax stream begins. So the City gets new infrastructure for free. The developer gets reimbursed for the cost of building that infrastructure. Meanwhile the School District gets only 25% of the revenue it should on the improved value of the property, but 100% of the cost of educating any of the school age kids who might live there. When the people of our community pass a school operating revenue levy, the expectation is that all property owners will be contributing an equal share of their property value to the operations of our schools. A TIF means the revenue from a particular piece of property gets redirected instead to building roads and sewers. 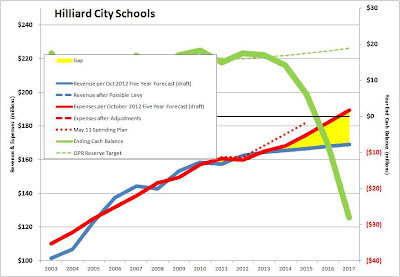 The very real political game being played here is that the elected officials in the City of Hilliard have figured out that a TIF gives them a cut of the school district's revenue stream, meaning they'll get to avoid the painful task of asking the people of their city to pay more taxes to fund these developments. Instead it becomes the burden of the School Board to put school levies on the ballot to replace the money redirected by the TIF. I made this very point before the City Council when they were considering the TIF for the Hilliard Summit and Anderson Meadows developments (which the City did implement, using the money to construct the new Roberts/Alton-Darby intersection and connector). But the reality is that most of us who live in the school district don't get to vote for the Hilliard Mayor, or for members of the Hilliard City Council. My wife and I have lived in the Hilliard School Community for 33 years, yet have never lived within the borders of the City of Columbus. When I addressed the City Council about this, they knew they weren't listening to one of their constituents. The Hilliard officials understand that dynamic, and clearly feel that they can use TIFs on residential developments with impunity, essentially pulling in money from everyone in the school district to fund infrastructure development in the City. I'm sure their argument is that the whole Hilliard Schools community benefits when these kinds of developments take place. It seems to me that the only entity which benefits from this economic arrangement is the developer. So why are the city leaders so eager to facilitate that? Here are the supplemental materials for the School Board meeting, being held at 7pm Monday, November 26, at Hoffman Trails Elementary School. UA Levy Defeated - What Does it Mean? Three of the most highly regarded school districts in Ohio had operating levies on the ballot this month: Worthington, Dublin and Upper Arlington. The first two had theirs pass, while UA's failed. I'll not try to analyze the whys and wherefores of those outcomes. Each community has its own personality and demographics, and I have no standing in their debate. But I think there is a lesson in the UA case which is worth examining. I had the opportunity to attend one of the EducateUA meetings. This was the group who mounted the formal opposition to the UA levy. While that name sounds like the loosely-coupled set of EducateXYZ organizations across the state which I had some hand in organizing (e.g. the EducateHilliard organization which supported Justin Gardner, Don Roberts and me in the last School Board election), and it is true that I at one time had registered the EducateUA.org domain, I had no part in the creation of this EducateUA organization. My objective for many years has been to educate community members about the true economics of public schools in Ohio so that they can make informed decisions about the governance of their local school districts. The "vote YES if you love your kids" mantras frustrate me, as do the equally ignorant "we waste too much money on ________" rants. The EducateUA folks decided to focus in on the compensation and benefits costs of their teachers. Okay, that's appropriate. As I've been saying for a long time, the economics of a school district is driven by the cost of the team of professionals recruited to fill the classrooms, and that's how it should be. I know very few UA teachers, but have many UA friends, primarily through our long membership at Mountview Christian Church. Those families moved to UA to partake of the UA schools, which means to have their kids in the classroom with UA teachers. The majority of kids who come out of the UA schools are a tribute to both their parents and the teachers. It is a place of excellence. Nonetheless, the mixture of sagging funding from the State of Ohio and growing compensation costs has driven the demand for increased school funding - primarily through local property taxes - to a pain threshold for an growing number of UA residents. That's a real problem, and it needs to be addressed. But I don't understand how cutting off the funding is alone a solution. If the EducateUA people think the total spending on teacher compensation is the problem, what do they propose to do about it? After all, the compensation schedule for the UA teachers isn't something new. It's been evolving for decades, approved at each stage by the school board members the UA voters elected. The total cost of the teachers is driven by their average comp/benefits times the number of teachers employed. The first is negotiated between the School Board the teachers' union, and the latter is a function of the programming and services the district chooses to offer. UA has a rich set of offerings, and that takes staffing. But that didn't change overnight either. Where they are today is the result of decades of decisions, once again approved by those elected to serve on their school board over those years. I suggested to the EducateUA folks that if they wanted to oppose the levy, they needed to tell the voters what they thought should happen if the levy was indeed defeated. From what I saw, they had no plan in that regard. They simply wanted to defeat the levy, and force the School Board and Administration react to the reduced funding. My suggestion to them was that the likely reaction is very predictable - the Administration will propose to the School Board that extracurricular programming be eliminated, or perhaps made a Pay-to-Participate system fully funded by very high participation fees. High school busing would also be eliminated. Neither would have that much of an effect on the budget, but would be painful - like a punishment to the community. Next, they'll cut some of the optional academic programming, like gifted services at the elementary level. Non-core courses at the high school level would also be on the chopping block, but which ones? The Last-In-First-Out layoff protocols insisted upon by the unions means that it's the lowest paid teachers who get laid off first, so lots of them have to be cut to make much of a difference. In the case of the Hilliard School district, approximately 15% of the teachers would have to be laid off to reduce the teacher comp costs by 10%. I may be wrong, but from what I can tell, the EducateUA group has not thought through any of those realities, and has no idea what the Administration is going to propose to the School Board, now that their levy has indeed been defeated. Not only that, but the UA School Board is in the midst of a Superintendent search, meaning that the Superintendent who really understands their system is leaving, and School Board has to convince the candidates to replace him that UA isn't in for a long levy battle of the kind which nearly tanked South Western Schools a couple of years ago. Few Superintendents want to walk into that situation. Both the pro-levy and the anti-levy groups need to do a better job of thinking through their positions, and quit campaigning on slogans and emotions. There is a very real economic problem to be solved: rising costs, which are almostly entirely due to compensation and benefits, and softening revenue sources, both from a State and local perspective. Cost growth trends versus revenue growth projections are out of whack, and tough choices need to be made to bring them back into alignment. I voted against our most recent Five Year Forecast because I don't think we're doing enough in Hilliard Schools to have that conversation either. If we can figure out now how to take $250,000/yr of cost out of operations right now, then it has the same impact on our projected +4 year cash reserves as slashing $1 million from our spending plan for FY17. Making moderately tough decisions now will help us avoid having to make gut-wrenching decisions in a few years. It's going to be interesting to see what happens next in UA. Will they get the Superintendent they want, or will the best candidates be scared away by a levy battle? How will the UA School Board react to the levy defeat? Are they going to just go back on the ballot in the Spring? I'm pretty sure they will, but will it be for the same mills, or less? If it's less, will EducateUA still oppose the levy? What if their levy is defeated again? And more importantly, how will we prevent our community from going down the same path? I know of no solution other than sincere, respectful, and empathetic dialog among the stakeholders, and we need to start soon. Notice is hereby given; there will be a CHANGE in meeting time of the Board of Education of the Hilliard City School District on WEDNESDAY, NOVEMBER 14, 2012 to 5:45 P.M. located at Hilliard City Schools Administration Annex, 5323 Cemetery Road, Hilliard, Ohio. Here is the supplemental material for the meeting. Note that the meeting is starting early so that the Board may go into Executive Session before the public session starts. This is, as we discussed publicly at the special meeting this week, so that we can continue the work of selecting a new Superintendent. I would expect the public session to begin at the normal starting time of 7pm. Notice is hereby given; there will be a SPECIAL meeting of the Board of Education of the Hilliard City School District on MONDAY, NOVEMBER 5, 2012 at 5:00 P.M. located at Hilliard City Schools Administration Building, 5323 Cemetery Road, Hilliard, Ohio. The meeting will be held in regular session to view presentations by the ESC of Central Ohio and OSBA regarding the Superintendent search process. At last night's meeting, I made the following statement regarding acceptance of the Five Year Forecast brought before the School Board for approval. See also my prior article on this matter. Along with the 2020 Plan and the Continuous Improvement Plan, I consider the Five Year Forecast to be one of the most important strategic planning documents produced by our District. I am very concerned about the proposed Five Year Forecast before us tonight. It’s not that I think there are errors in the calculations. I have full faith in Mr. Wilson’s skills, and know that the numbers are an accurate representation of the assumptions which accompany the forecast. Nor can I point to any one assumption and argue that it is incorrect. I am confident that Mr. McVey and his leadership team have seen to it that the spending plan in this forecast is consistent with the 2020 Plan and the CIP. But the amount of new money required to fund this plan is too much to ask of our community, in my opinion. By 2017, this plan shows a $20 million gap between annual funding and annual spending, with an accumulated deficit of $28 million. As a Board, we made the commitment to the community that if they passed the 5.9 mill that we placed on the ballot in November 2011, we would not ask them for more money until 2014. I understand that as our expenses grow, the school funding system we have in Ohio requires us to periodically go before the voters and justify the need for more money. I believe this is a good thing – it holds us accountable to be good stewards of the taxpayers’ money. And we need to help the taxpayers understand that costs do go up – in particular the 86% of our budget related to compensation and benefits go up – and with state funding flat, and having the potential of dropping further still, the only way to fund these increasing costs will be additional local taxes. By my calculations – not confirmed by the Treasurer – a levy of 7.7 mills would need to pass in 2014 to fund this forecast. That’s about $235 more per year per $100,000 of valuation, or about $475 more per year for a typical homeowner. I very much doubt that our community has the appetite for a tax increase of that size. Maybe the economy will be in much better shape in 2014, and a levy of this size will sound reasonable. And maybe the State will come through with more funding if the economy recovers. But I doubt it. I think the time has come to start having some tough conversations about the breadth of our academic offerings, and the services we provide. We need to think some more about the extent of our extracurricular programming, and how much is funded by taxes vs participation fees. I believe that approving this Five Year Forecast implies that everything is just fine. But we have some very hard work to do, as a School Board, as an Administration, and as a community. We together need to recalibrate our expectations with what we are willing to invest, and we need to start doing that sooner rather than later. 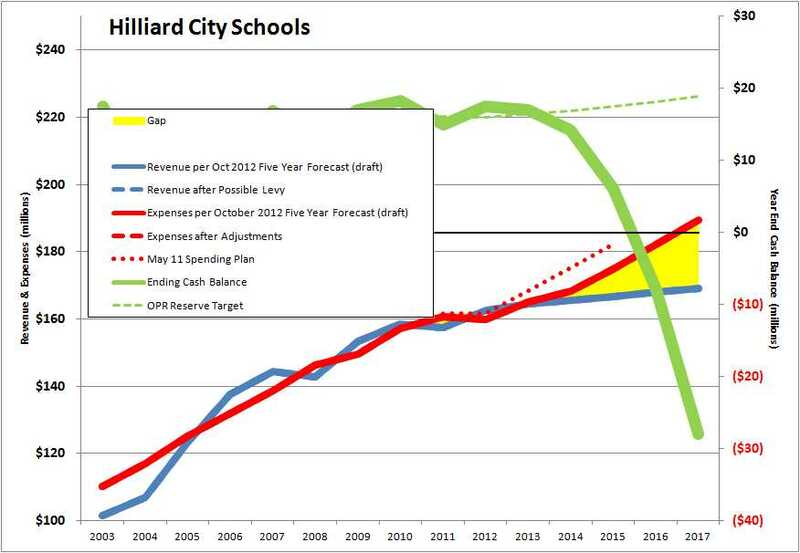 Therefore, I believe it is appropriate to not approve this proposed Five Year Forecast, and that the Board should ask the Superintendent and Treasurer to come back to us with a new Forecast , or perhaps two or three new forecasts, with spending plans requiring a significantly lower level of additional local funding. When the vote was taken, I voted against accepting this Five Year Forecast. The other members all voted in favor, and the resolution passed 4-1. Also on tonight's agenda - Item F2 - will be a vote to approve a new Five Year Forecast, as the Board is required to do by law each year. The yellow region highlights the gap between proposed spending and expected revenue. This Forecast shows the difference in FY17 between proposed spending and expected revenue to be $20 million, and our cash balance to be $28 million in the hole. Ohio law does not allow a public school district to have a negative cash balance, and so that situation will have to be fixed. We have to spend less money that this forecast proposes, generate more money with new local levies, or - more likely - do some of both. A 7.7 mill levy has a slim chance of getting approved by voters, in my opinion. 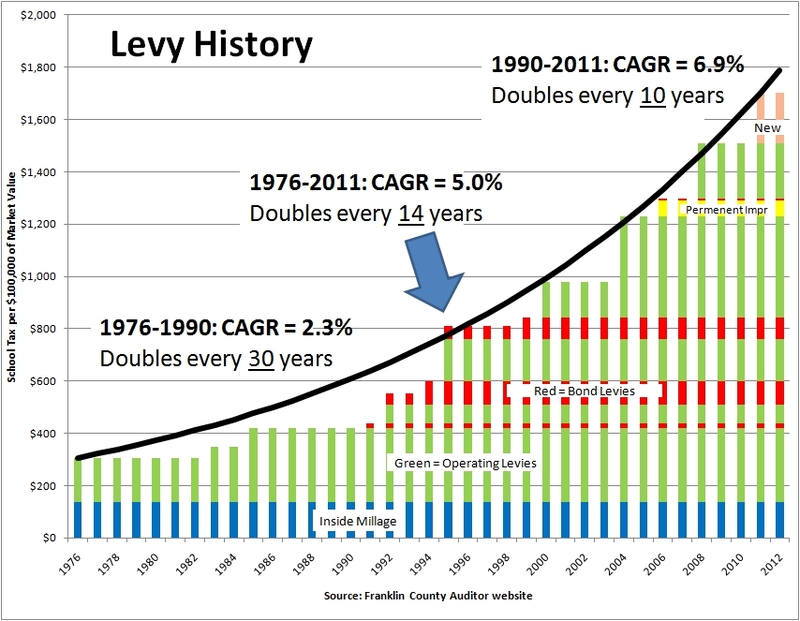 The voters barely - just barely - passed a 5.9 mill levy last time, after shooting down the 6.9 levy issue on the prior ballot. 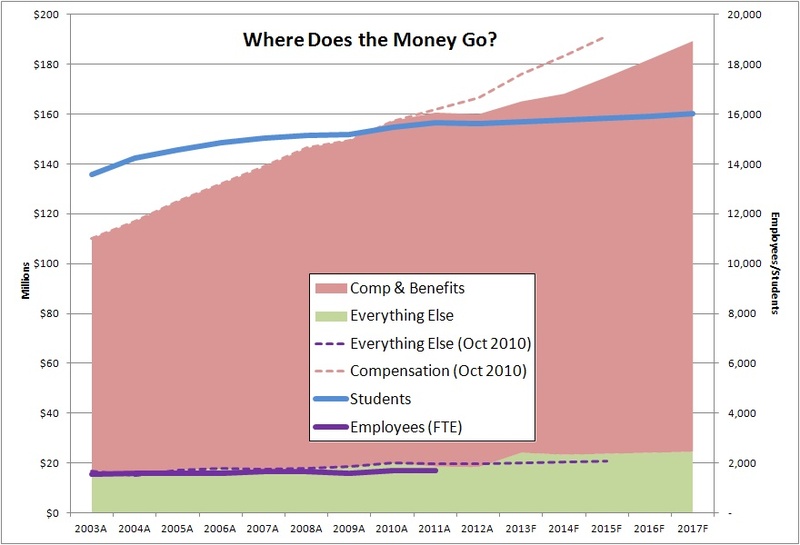 The dotted line in this chart is where spending was expected to be when the Oct 2010 version of the Five Year Forecast was approved. You can see that total spending is this new forecast is projected to be $20m/yr less in FY15 than was the projection just two years ago. This is the impact of the pay freezes agreed to by the two unions, as well as the many retirements. This forecast assumes that in the next few years, the compensation for teachers and staff will increase 1% per year in base pay, and that the current step schedule will resume (4.15% in years 0-15, 20 and 23). I recommend that you read this article if you're not familiar with the teachers' pay structure. I am also concerned about the way our health insurance costs are increasing. Even with a just-approved design change to the benefit structure, our insurance costs look to be increasing 13% next year (it would have gone up 15% without these changes). Remember that we're self-insured, so these costs are equal to the actual claims, plus 9% for our stop-loss insurance and Third-Party-Administrator fee. Also note that the employees are now paying 15% of the cost, up from zero prior to 2008. Our total compensation and benefits costs - 86% of our total spending - is the product of the number of people we employ, and what we pay them. We may have reached the time when we have to talk seriously about the first term of that equation - how many people we employ. Please don't just say "chuck out all the administrators." We run relatively lean at the administrative level, and I'm pretty concerned that all this clamor about more teacher evaluations and performance-based pay is going to significantly drive up the administrative burden as these policies are enacted. I think we're finally going to have to talk about the breadth of programming and services we offer. I'm trying to gather enough information to start to frame the dialog. But I suspect one or both of these things are going to have to happen: a) we'll have to eliminate some academic offerings and support services, and, b) make our extracurricular programming be substantially supported with user fees. Everything has to be on the table. Here is the supplemental material for Monday's School Board Meeting. Item E1(a) is one that is rarely on our School Board agenda - approving the retirement of the Superintendent, effective June 30, 2013. There will be much to say about Mr. McVey in the coming months, and many opportunities to recognize his significant contributions to our community. Item E1(a) allows the School Board to begin the process of recruiting a new Superintendent, and that work will begin immediately, starting with the School Board deciding how we want to proceed. After Monday's meeting, we will have 250 days to complete the task. That may sound like a long time, but there is much to do, starting with building a list of candidates. This is a continuation of a series which began here. Each of those points merits a substantial discussion, and shelves of books have been written on these topics. We'll touch on only the first three in this article. A rare and awesome responsibility has this week been placed upon the Hilliard School Board: The hiring of a new Superintendent, the Chief Executive Officer of our school district. This comes about with the announcement by Dale McVey that he would be retiring at the end of the school year, June 30, 2013. In the 30 years my family has lived in the Hilliard Schools community, we've had just two Superintendents: Roger Nehls and Dale McVey. Roger was on board at the beginning of the exodus of families from Columbus City Schools to the suburbs, brought about in the late 70s in reaction to the order of Judge Robert Duncan in Penick vs. Columbus Board of Education to implement district-wide student busing to racially rebalance the Columbus City schools. Roger resigned in 1999 to become an Assistant State Superintendent with the Ohio Department of Education. Dale, who was then serving here as an Assistant Superintendent, was asked to serve as Interim Superintendent at that time, and was named Superintendent six months later. There is a good article about Dale's exemplary career on the district website. It has been 13 years since a Hilliard Board of Education has had to hire a new Superintendent. 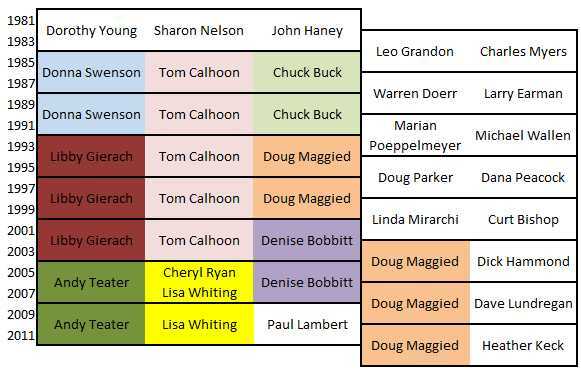 If my records are correct, the members of the School Board at that time were Libby Gierach, Tom Calhoon, Doug Maggied, Linda Mirarchi, and Curt Bishop. So of the current School Board members, only Doug has been through this process before. It is an interesting time to be searching for a Superintendent -- we're not the only district around here looking. With Dale's retirement, we now have the Canal Winchester, Columbus, Dublin, Upper Arlington, Westerville, and Whitehall School Boards all looking for a new chief executive at the same time as us. So what should we look for in our new Superintendent? The Upper Arlington community is tackling that question by running a series of focus group sessions, which happen to have been held this week at my church, Mountview. With permission, I sat in on a couple of those sessions just to see what they were about. There was a group just for Principals, another for the teachers' union, and another for the staff union. The PTO Presidents had their own sessions, as did the UA Education Foundation. In all, there were more than a dozen separate focus group sessions, including several open to any resident of the community. The sessions were facilitated by consultants from the recruiting firm that has been retained by their School Board. The couple of sessions I observed - one with the PTO Presidents and one with the Education Foundation - collected a lot of the same information: UA is an well-educated community of accomplished folks, most of whom moved there because of the reputation of the UA schools, and their expectations are very high. They told the consultants that there is a "UA Way" to get things done, and the new Superintendent needs to respect that. But I also heard a couple of folks remark that it's sometimes difficult for new people coming into the UA community to be accepted into positions of influence. I'm not trying to defend or refute anything I heard in these sessions. UA and Hilliard each have their own character, so what is felt there may or may not have much in common with our community. I described their approach just to let you know what at least one other School Board is doing to carry out their search. Our Board will begin this discussion at our next meeting. The occasion of hiring a new Superintendent presents the opportunity to recalibrate the relationship between the Board and the Superintendent. At our Retreat last week, I observed to the other Board members that the governance of our District is very much driven by a strong Superintendent in Dale McVey. Our Board takes a Follower role, as can be seen in the agenda of any of our regular meetings. With rare exception, the agenda is limited to those things which by law must come before the School Board, and each resolution starts with "Superintendent recommends...."
Other school boards handle things differently. I particularly like the structure employed by some, who use one meeting each month to deal with the routine items requiring board approval, and then use the other meeting to delve into key aspects of the operation of the school district. What is examined, and when the discussion is to occur is scheduled far in advance. For example, every February, the Board may focus its time on transportation issues. Curriculum may be addressed each October, and technology each April. This strikes me as more productive than trying to concentrate all those discussions into an annual Retreat lasting a total of ten hours each year. But the real question is "Who is in charge?" The Dispatch ran an editorial this week on this subject. While the particular point of this editorial was to criticize school boards who allowed their access to district employees to be limited by their administrators (not the case in Hilliard by the way), the broader issue is in regard to the built-in tension between a governing board and the executives they hire as to who gets to make the big decisions. The really good leaders want to have as much autonomy as they can get away with. I'm reminded of a scene in the movie "MacArthur," where the General, in the midst of his struggle with President Truman over who would dictate strategy during the Korea War, remarked to an aide: "My job would be so much simpler if I didn't have to deal with these temporary residents of the White House." I can understand Superintendents feeling this way as well. After spending decades gaining skills, understanding, and experience as to how to make a complex organization like a school district function effectively, along come these yahoos - most with no education background - who get elected to the School Board every couple of years and try to tell the Superintendent what to do, and how to do them. 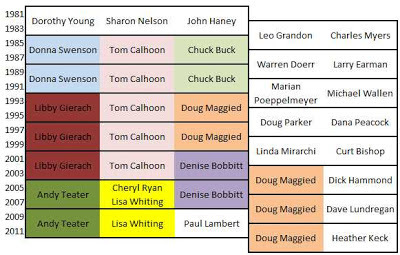 During Dale McVey's tenure as Superintendent, we've had fifteen different people serve on the School Board. It could have been as many as 20 different folks, but a number have successfully run for re-election, including Doug Maggied who is now serving his fifth term. I find it interesting that in the years when three Board seats come up for election, the incumbants tend to run for re-election and retain their seats. Conversely in the years when only two seats are up for grabs, it seems that either the incumbent decides not to run again, or gets defeated in the bid for re-election. Doug Maggied is the anomaly, as he was defeated by Denise Bobbitt in 2001, but came back to win a seat again in 2003, which he has held ever since. In my role as an executive in private industry, I had many occasions to be called before our Board of Directors to defend a program we had planned, especially when it had large dollar amounts attached to it. While being very smart and accomplished folks in their own realms, rarely did the Board members understand the technology involved, the complexity of the process, or the importance of the program to our mission. Nonetheless, they represented the owners of the company - the shareholders - and it was their money I was asking for. Consequently, the burden was on me to make the case for the program in terms they could understand. And yes, it was helpful when the Board membership was stable, and we didn't have to be teaching new folks about the business all the time. So perhaps the question is not only what kind of Superintendent we want, but also what kind of School Board we want to be. Or more correctly, what kind of school board do you - the voters of the community - want us to be? You are after all the 'owners' of the school district. It's not the Administration, or the teachers, or the staff. It's not even the kids. Our job as a school board is to represent your wishes in the governance of the school district. What should we strive to keep the same? What should we change? Your respectful dialog is welcomed. On his blog, "10th Period," Stephen Dyer poses the question: "Should (a) Homeschooler Be On the State Board of Education?" Mr. Dyer, an attorney and former State Representative from the Akron area, doesn't directly answer his own question, but the insinuation is that someone who does not send his own children to public school has no place on a public school board. I believe this shows how much the role of a governing board is misunderstood, as well as who it is that those officeholders are supposed to be representing. Although having never met him, I trust that Mr. Dyer is an intelligent and well-educated person, but I sense he is one of those who believes that the role of a governing body, like a Board of Education, is to represent the interests of the institution. The primary role of a governing board - and it doesn't matter whether we're talking about the US Congress or a local school board - is to represent the Voters in matters of the governance of the institution. In the case of a public school district, it doesn't matter whether an elected member of the school board has kids in the public school, kids in a private school, kids who are home schooled, or no kids in school at all. The community of taxpayers who fund our schools spans all those groups, and all have a right to be represented on the school board. According to the community survey performed in March of this year, 61% of the households in our community have no school age kids (Q23), and only 12% of those will be enrolling a kid in the next 5 years (Q24). Interestingly, three of the five current Hilliard School Board members - also 60% - have no school age kids in their household (Lisa Whiting, Doug Maggied and me). So in that dimension at least, our Board seems pretty representative of the community. As the title of this article suggests, I have more to say regarding the role of a public school board, and will continue the conversation soon as part of my discussion of the recent School Board Retreat. Here are the supplemental documents for the meeting of the Hilliard Board of Education to be held at 7pm on Monday Oct 8, 2012 at Hilliard Station Sixth Grade Building. The minutes from the School Board Retreat held 10/27-28 give little perspective on the hours of presentations and discussions which took place. I was both encouraged and disappointed by how this year's Retreat went, and will give you my thoughts in a future article. From the Central Office: Hilliard City Schools invites residents to the first “Online Lunch with the Superintendent” this school year. This interactive community engagement opportunity allows residents to not only learn more about the district, but to ask questions from top-level decision makers in the Hilliard City School District. The October 10 session begins at noon and will focus on what innovation means for Hilliard City Schools. The session will begin at noon and last about an hour. Participants simply need to go to the district’s website, www.hilliardschools.org, and click on the link to join the online discussion. The Cincinnati Enquirer recently ran a story about the Little Miami Local School District down in Warren County, describing how that school district seems to have hit bottom, and is now on the path to recovery. The Little Miami school district almost ceased to exist. It has been in Fiscal Emergency for two years, meaning that a panel appointed by the State is running their school district, not the local School Board. They had closed down buildings, eliminated arts, music, physical education, AP classes, and busing. Parents were pulling kids from the district and enrolling them elsewhere. There was talk of dissolving the district and parceling out the territory to the surrounding school districts. It's a tale we should learn from. Little Miami isn't a school district in an impoverished rural area. Rather it's an affluent bedroom community of the Cincinnati/Dayton metro area. Like Hilliard, it had been mostly farmland until the last twenty years, when it was rapidly developed and covered with upscale houses. According to the Ohio Dept of Education's Cupp Report, the average property valuation per student in Little Miami is $178,000, which is 15% more than ours here in Hilliard. Average income is almost identical to ours. Their schools perform very well, achieving an Excellent rating on their State Report Card, with a Performance Index of 102.9. So how did they get into so much trouble? One problem seems to be that they didn't pay attention to the balance between residential and commercial development. The Little Miami local property tax base is 94% residential/agricultural, compared to 75% for Hilliard. And because their per-pupil property valuations are high, they don't get much state funding - $2,900 per pupil in FY11, and that has gone down slightly in recent years (our state funding was $3,600/pupil in the same year). That means the burden of funding their school district falls substantially on the back of their local homeowners. While their cost of operations rose due to both growth in the number of students, as well as growth in the compensation of their teachers, staff and administrators, they had no other place to go for additional funding than the homeowners, and the voters refused - repeatedly. The effective operating millage (ie not including bond levies) paid by Little Miami homeowners was 24.39 in FY11, compared to 42.03 for those of us in the Hilliard school district. At their millage rate, the average Little Miami homeowner was paying $4,300/yr $1,336 to fund operations. Had they been paying our operating millage rate (effective), it would have been $7,500 $4,785. As a district in Fiscal Emergency, what solutions did the state-appointed oversight Board come up with? They said an operating levy issue had to be put on the ballot - a whopper this time - and it had to pass. They didn't say what would happen if it didn't pass, but the implication was that the district would be dissolved. I'm not sure that would be an easy, or politically acceptable solution either. After all, why would the surrounding districts want to take on that mess? Absorbing Little Miami would just screw up the residential/commercial funding mix of the 'acquiring districts,' forcing them to raise their taxes (or cut programs/services) to underwrite the cost of the new kids from Little Miami, who would not be bringing enough funding with them - even after being lifted to the tax rate of the acquiring district. That scenario was avoided. The Little Miami district put a whopping 13.95 mill operating levy on the ballot, and it passed, raising the property taxes of the average homeowner by $2,500 $765 per year. The Little Miami situation was entirely predictable, and avoidable. But the general ignorance of the public in regard to school economics allowed them to be led like lambs to the slaughter. Who was doing the leading? The land owners, land developers and home builders of course - same as always. 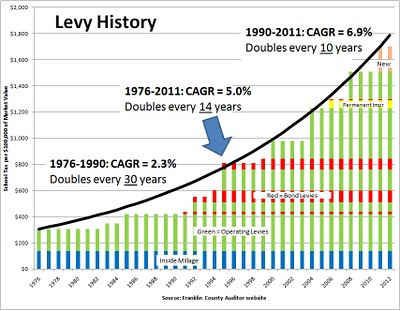 I have confidence that during the housing boom, potential buyers were being enticed to come to the bucolic setting of Maineville OH, where their kids could attend the high-performing and safe Little Miami Schools, which by the way also has the lowest property tax rate in Warren County. The problem is that with every house built, the school economics got more screwed up: the incremental taxes generated by a new home do not cover the fully-loaded costs of the school age kids who will live there. If there is not commensurate commercial development to help pay the bill, the cost of new kids has to be underwritten by the rest of the community. Meanwhile the land owners, land developers and home builders ride off into the sunset with their pockets stuffed with all the money the new homeowners borrowed to get into a great school district (see also "How Should Our Public School System Be Organized"). Why should we in Hilliard care about what happened in Little Miami? Because those same dangers lie ahead for us. The Hilliard City School District grew from a little village operation into one of the ten largest school districts in Ohio in the span of twenty years. The student population exploded, we constructed new school buildings at the rate of one per year, and our taxes took off. The recession slammed the brakes on residential growth in our district, but it's showing signs of picking up again. The City of Hilliard has for a couple of years been accepting annexation requests from the various developers who own the thousands of acres of land on the west side of Alton-Darby Rd. One of them, Planned Development, the developer of Heritage Lakes, has submitted a plan to the Big Darby Accord Advisory Panel - with the support of the City of Hilliard - for a large new single-family and multi-family development near the corner of Alton-Darby and Davis Rds. In March, the Hilliard City Council, at the request of Dominion Homes, rezoned 57 acres north of Homestead Park for development. We' re in a kind of quiet time right now. No levy on the ballot, and another year to run on the teachers' contract. We have some room to grow in our school buildings, and enrollment has been stable for several years. I think this makes it an excellent time to embark on a community education program with the goal of equipping folks to engage in the dialog about where we should go next. In a way, we're fortunate that the recession came along and stopped what could easily have become a runaway train - putting us in the situation of Little Miami. We have the opportunity to go forward in a well-managed manner if we use this interlude to get our strategic plan together, taking input from all the stakeholder groups. I hope we will begin this process at the annual Board Retreat, coming up in September.